POOL CLOSURE NOTICE: Pool and Jacuzzis will be temporarily closed from May 13-19, 2019 for annual maintenance work. Pool is scheduled to reopen on Monday, May 20th (May 27th for Jacuzzis). Compensation at 20% of room rate will be provided after closure begins. 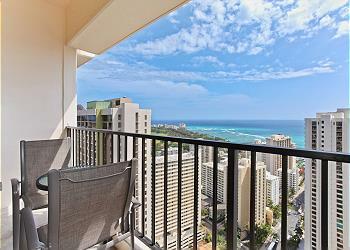 Captain Cook Resorts condominiums at Waikiki Banyan are just a short walk to world famous Waikiki Beach where you will find some of the finest swimming and surfing on the island. The Waikiki Banyan condos have ocean, Diamond Head or mountain views, offer air conditioning, full kitchens and private lanais. There are coin-operated washer/dryers on each floor. 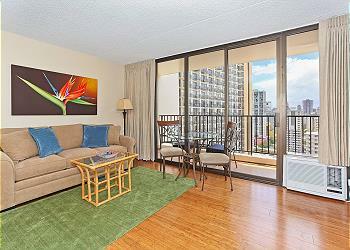 All Captain Cook Resorts Waikiki Banyan properties offer FREE WiFi and free parking. 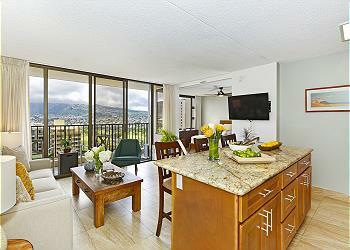 Captain Cook Resorts Waikiki Banyan vacation rentals are great for families and known for being the most kid-friendly property in Waikiki, with large recreation decks, BBQ grills, children's playground, heated pool, Jacuzzi, sauna and lighted tennis courts. Banyan Breeze Coffee Co is located in the lobby of the Waikiki Banyan and features iced tea, lemonade, fruit smoothies, breakfast bites and an assortment of sandwiches and salads. Waikiki Banyan condos are sought-after properties and Captain Cook Resorts Vacation Rentals has a number of options from which to choose! 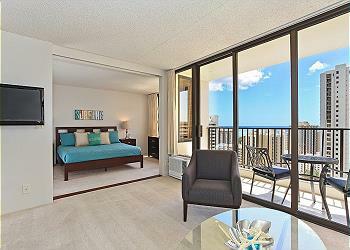 Sweeping ocean views from penthouse-level one-bedroom with AC! Sleeps 4. Price per night from $95 to $145 USD Plus taxes and fees. Monthly rental. Contact us for shorter stays in another rental. 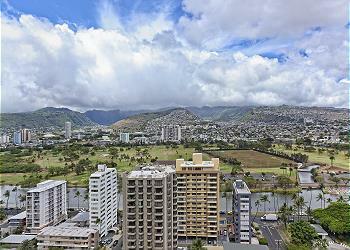 Sweeping ocean views from this upgraded penthouse-level, air-conditioned 1 bedroom condo. Full kitchen, one FREE parking, WiFi, pool, tennis, BBQ. Sleeps 4. Available for stays of 30 days or more. 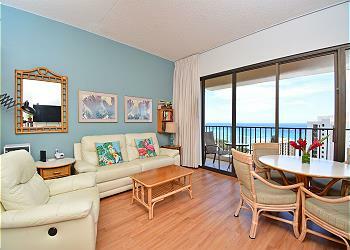 One bedroom vacation rental with partial ocean view-short walk to the beach! Price per night from $125 to $225 USD Plus taxes and fees. 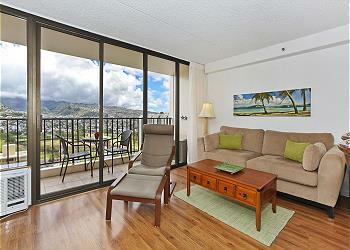 One bedroom vacation rental with partial ocean view, AC, washlet, and short walk to Waikiki Beach! Full kitchen. Includes one FREE parking, WiFi, local, long distance calls to US and Canada, pool, hot tub, tennis, children’s play area, BBQ. Sleeps 4. One-bedroom vacation rental with AC, WiFi, parking and short walk to beach! Price per night from $140 to $235 USD Plus taxes and fees. 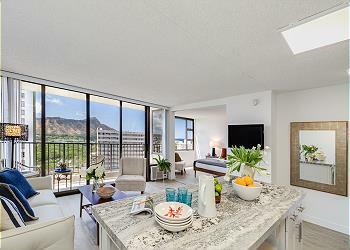 Bright corner unit with AC and beautiful mountain views! Sleeps 4 adults or a couple with 3 small children. One FREE parking and WiFi! Pool, tennis courts, BBQ area, playground, hot tubs! Just a block and a half to the beach! Ko'olau Mountains & Ala Wai Canal Views - City Lights Sparkle at Night! Price per night from $145 to $235 USD Plus taxes and fees. 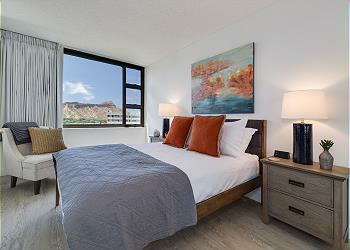 Great views of mountains and city lights at night from this upgraded, modern contemporary condo. Freshly painted and newly decorated. King bed, one FREE parking and WiFi, pool, hot tubs, tennis courts, BBQ area! Walk to restaurants. Sleeps 4. Views of mountains & Ala Wai Canal - Waikiki city lights sparkle at night! Price per night from $130 to $235 USD Plus taxes and fees. Great views of mountains and city lights at night from this upgraded deluxe condo. Freshly painted and newly decorated. Laminate wood floors. Renovated kitchen. One FREE parking and WiFi, pool, tennis courts, BBQ area! Walk to restaurants. Sleeps 4. Diamond Head Views! Freshly renovated! A/C, Parking and WiFi Included! Price per night from $165 to $240 USD Plus taxes and fees. Just renovated (2017)! Modern contemporary has magnificent Diamond Head and partial ocean views! A/C, WiFi, and FREE parking! Pool, hot tub, tennis court, play area and BBQ area! 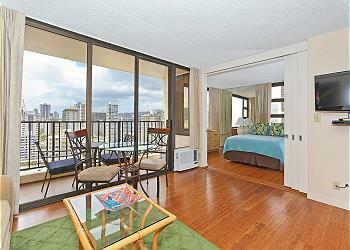 Just 1.5 blocks to Waikiki Beach! Sleeps 4. Price per night from $135 to $235 USD Plus taxes and fees. 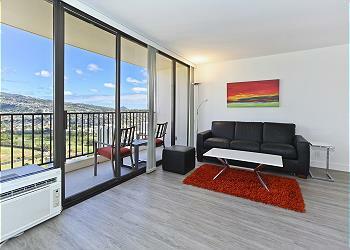 Deluxe one-bedroom with mountain and city lights views, laminate wood flooring, AC, one FREE parking and WiFi, pool, tennis, BBQ, and children’s play area on site. Short walk to the best swimming and surfing beaches in Waikiki. Sleeps 4. Price per night from $160 to $245 USD Plus taxes and fees. Savor these incredible 34th floor ocean views! You’ll love this clean contemporary with cool tile floors and AC, FREE parking and WiFi, communal pool, hot tubs, tennis courts, sauna and BBQ area! 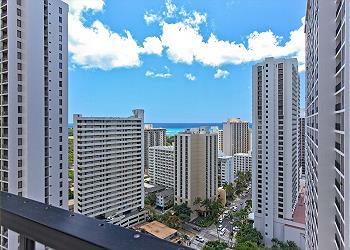 Just a block to world famous Waikiki Beach! Sleeps 5. Mountain View with AC, WiFi, parking, short walk to beach! Price per night from $140 to $225 USD Plus taxes and fees. NEW TO OUR INVENTORY! Ready for YOU to make yourself at home! 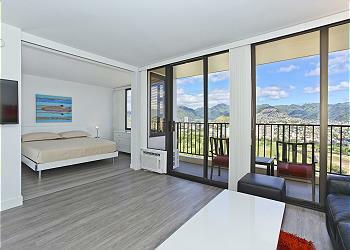 Ko'olau Mountain view, contemporary decor, AC, WiFi, one FREE parking, and just a short walk to beach! Price per night from $175 to $250 USD Plus taxes and fees. Partial Ocean View, one-bedroom with AC, WiFi, parking, short walk to beach! NEW TO OUR INVENTORY! Freshly renovated and ready for YOU to enjoy! Partial ocean view, contemporary decor, AC, WiFi, one FREE parking, and just a short walk to beach!